Windows 10 users often facing the situation when the Service Host: Local System process (svchost.exe) consumes a lot of system resources. This process can highly use memory, CPU or disk. The problem can occur after the Windows update is installed, while the system maintenance tasks are running, after your device exit the sleep or hibernate mode, or by itself at any time. Service Host: Local System is a set of system processes and you can’t completely suspend or kill the whole process using the Task Manager. The Service Host: Local System process can include several different services (depending on the computer settings and the Windows 10 build). More often it’s just enough to restart the computer to fix the problem, because the error is caused by a single case of failure of one of the services which are related to the process. However, if the reboot was not enough and the service still highly loads CPU and disk immediately after the computer boot, try to temporarily disable the antivirus and check if the high disk/memory usage problem still persist. Also it is worth trying to disable its automatic startup at Windows startup through the antivirus settings. To reduce the system high load, you can try to restart or disable one of the services related to this process. But through the Task Manager you can’t determine which of the services in the process “Service Host: Local System” heavily loads the system (note that in the Task Manager there can be several processes named Service Host: Local System). How to Fix Service Host Local System High CPU Load? To identify which of the services related to the Service Host: Local System causes a high disk/memory/CPU usage in Windows 10, you can use the free Microsoft tool – Process Explorer (https://docs.microsoft.com/en-us/sysinternals/downloads/process-explorer). Download the archive with the tool and unpack it. Run the program procexp64.exe (on Windows 10 x64) as administrator. 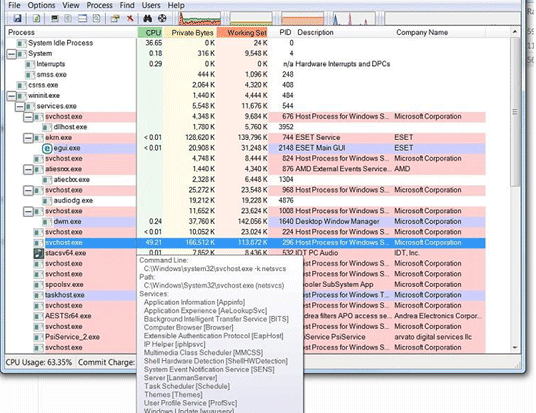 Sort the processes by memory or CPU usage in Process Explorer by clicking on the column header. Find the process svchost.exe, which consumes the most resources of the system. 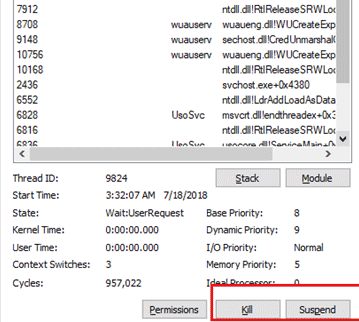 Hover your mouse pointer over the svchost.exe process and you will see a popup with system services list that are running under this process. Now right click on the svchost.exe process and select the properties. In the process properties window, click the Services tab. Here you will also find a list of services that executed under this process. Note that the library file that is being used by this service is specified for each service (for example, wuaueng.dll or usocore.dll). Now go to the Threads tab. It contains all the threads that are executed within this service. Sort the threads by CPU and Cycles Delta usage, and look for the name of the service and/or dll library that causes the high load. Try to temporarily suspend or disable the found thread using the Kill and Suspend buttons. Wait for a while and check to see if the abnormal system load has decreased. In this way, you can find and suspend all services that can cause high memory and disk usage. You can map dll names to service names and temporarily disable them from the Services Management console (services.msc). Update your Windows 10 build and install all the latest cumulative updates.